Our house provides three rooms of 20m² which are furnished and have French windows. The residents of these rooms share a bathroom and a toilet with one other person. All rooms in this accommodation unit share a kitchen and a common room with a balcony. 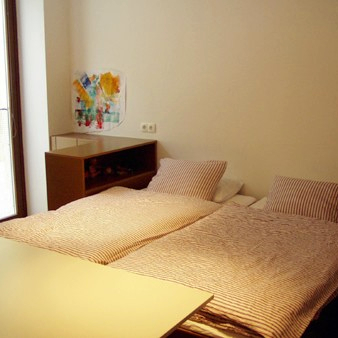 In the first floor there is another couples’ room of about 20 m² with a bathroom and a toilet. There is also free internet access in these rooms. The whole unit shares the kitchen, a common room and a terrace.